PARADISE — Bev Zitting had become accustomed to looking out her window and seeing 27 wild turkeys foraging in her front yard. “They used to come everyday around noon,” she said. But Zitting hasn’t seen the large birds in about a week. According to the Utah Department of Wildlife Resources, wild turkeys have begun to move out of Mendon and into the more welcoming towns of Paradise and Nibley. Zitting took notice of the large birds and liked tracking them throughout the day. Beginning their day in a pasture behind Zitting’s house, the turkeys would start by eating hay with a neighbor’s cattle. Avoiding Zitting’s three dogs, the birds would then make their way to her front yard where they would stay and eat for about a half hour before moving on to another location. 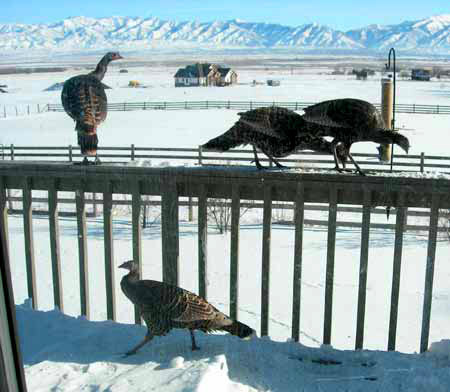 Nibley, another town the DWR says is experiencing this turkey migration, hasn’t received any reports of turkey problems according to city officials. “I saw one on the side of the road a couple of months ago but other than that we haven’t heard anything,” said Denny Clark, Nibley city clerk. The DWR is currently trapping and relocating turkeys in Paradise and Mendon, but some residents are still appreciating their presence.